DC announces that Keith Giffen and J.M. DeMatteis are concluding their run on the title in June. Update: A DC Comics representative has confirmed to The Escapist that the series is being cancelled, and that issue #12 will be the final issue. Original Story: Sad news for aspiring galactic criminals. It looks like greed isn't enough to keep the average supervillain operation solvent. The economics of comic books is a tricky thing. Yes, compared to television or film, it doesn't cost very much to publish a comic, but even so, the line between a sustainable comic and one bound for the chopping block isn't very thick. Take Larfleeze for example. The Green Lantern spinoff, featuring the orange light-wielding supervillain* enjoyed a tepidly strong debut in June 2013, with issue #1 selling 36,638 copies. Unfortunately, the title quickly started bleeding readers, dropping to just over 18,000 issues sold by October, and by January, the title moved a paltry 13,950. This drop in sales might be related to a larger trend in overall declining comics sales - in February, only one title, Batman #27, sold more than 100,000 copies - but it's still a staggering decline of over 50%. That might be why DC appears to have quietly announced its cancellation. In a PR release, the company revealed that issues 6-12 will be collected in a trade paperback due for release this December. But what is telling is how the company phrased the announcement. "Written by the legendary creative team of Keith Giffen and J.M. DeMatteis, LARFLEEZE VOL. 2 conclude (sic) their run on the renegade Orange Lantern of Avarice. Collects issues #6-12." DC hasn't yet issued a clarification, but based on sales figures and the lack of trumpeting a new team for the title, it's not a large leap to conclude issue 12 will be its last. Summary: Under mysterious circumstances, Larfleeze has become the biological embodiment of a power battery. 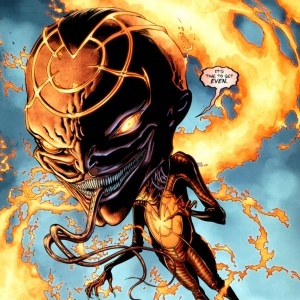 Having been defeated by his once-undead Corpsmen, Larfleeze is locked away in a dungeon to serve as the remaining Orange Lantern's power battery. It will take a cosmic miricle for Larfleeze to escape and regain control over his Orange Lanterns. Written by the legendary creative team of Keith Giffen and J.M. DeMatteis, LARFLEEZE VOL. 2 conclude their run on the renegade Orange Lantern of Avarice. Collects issues #6-12. I haven't read it myself (I know, part of the problem and all that), but it's frustrating to see titles cancelled nonetheless. This might not be part of a trend, but from where we sit it certainly looks like DC is culling its weaker titles. We'll definitely be paying attention to see who's next. Any of you out there fans of Larfleeze? Let us know in comments what you think. * Sidenote for those of you who don't know: in the Green Lantern cosmology, colors are associated with the so-called emotional spectrum, from which various factions in the Green Lantern family draw their powers. Green light = willpower, yellow light = fear, orange light = greed and so forth. The more you know.